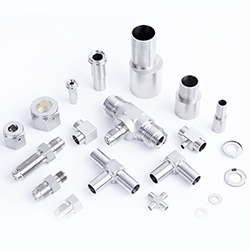 DK-LOK® Clean Fittings product offering consists of micro-fit weld adapters, metal gasket face seal connectors, and automatic weld fittings. All adapters are manufactured, cleaned and packaged accordingly to meet the highest standards of cleanliness, surface finish level and material compatibility to meet clean industry requirements. Materials consists of S316, 316L, 316L stainless steel var. Surface finishes available are non-electro-polished having a 10Ra finish. Electro-polished surfaces have a 5Ra finish. Passivation is done in accordance with ASTM A380, Ultra-sonic cleaning is performed in a class 100 environment with resistivity over 18M D.I. water after finishing the passivation for precision cleaning. After cleaning, all product is double bagged in the clean room using anti-static polyethylene bags with high purity nitrogen inclusion.